Earthworm Jim first released on the Sega Genesis today in 1994. The strange side scroller married offbeat humor and experimental level design. The result was a hodgepodge of a game that was frustrating but engaging. 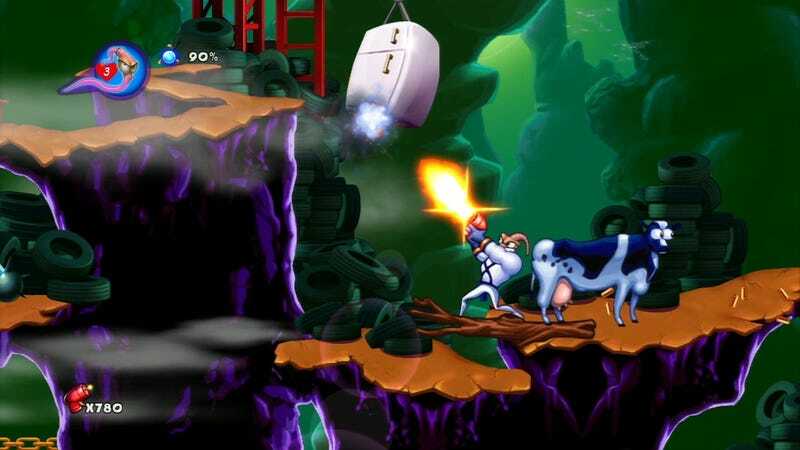 Developed by Shiny Entertainment, Earthworm Jim positions itself largely as a work of satire seeking to upend various side scrolling tropes of the time. It follows the titular character on a quest to save Princess What’s-Her-Name. This calls attention to the tired damsel trope by explicitly positioning the princess as an afterthought. It’s smart. Earthworm Jim is by no means progressive, but it reshuffles genre conventions to point out their absurdity. This recontextualizing fails more often than it succeeds, particularly in the raw game design. Earthworm Jim’s level design is a hostile jumble of platforms, spongy bosses, and unintuitive progression paths. The game is extremely vertical, asking players to weave strange movements throughout levels that are often hard to visualize. If Super Mario Bros is about reliably moving to the right, Earthworm Jim is about chaotically moving everywhere. The game’s first stage, “New Junk City,” is a maze of ziplines and difficult ledge grabs. “What the Heck?”’s landscape is full of high walls that create frustrating dead ends. In spite of various movement options such as high jumps and the ability to use Jim’s head as a whip to swing over gaps, Earthworm Jim is not fun to navigate. What Earthworm Jim lacks in core mechanics, it makes up for in willingness to experiment. There is bungee-jumping combat against snot monsters, interstellar chase sequences, labyrinthine underwater mazes, and long descents down spike caverns using Jim’s head as a propeller. The wild chase sequence “Andy Asteroids?” recalls the difficult speeder bike sequence from Battletoads’ third level, while the laborious underwater travel in “Down the Tubes” calls to mind Teenage Mutant Ninja Turtles’ notorious water dam. The variety is admirable and fits with the game’s wacky tone. These levels are also frustrating, exaggerating the failures of prior games at the expense of the player. “Down the Tubes” might highlight how annoying water levels are but it does this by forcing to player to endure a terrible water level. “Andy Asteroids?” punishes the player with a boss fight should they fail. In seeking to satirize bad platformer design, Earthworm Jim creates a far worse game than the source material. Earthworm Jim is a game with a vision: be cruel. The game’s irreverence backfires in the end, with Princess What’s-Her-Name suddenly being crushed by a cow. Earthworm Jim attempts to mock the conventions of the time, but what it attempts to satirize ultimately proves more resilient. Mario’s still kicking, but, as the years pass, it even more clear that Earthworm Jim’s dazzling experiment failed for good reason.